Gour Kishor Ghosh born on June 22, 1923- died on December 15, 2000) remembered as a prominent Bengali writer and also a Professional journalist. He wrote many remarkable books for Bangla readers used under the pen name Rupdarshi. His notable books are Ei Kolkatay, Naksha, Curcus, Kathay Kathay, Nacher Putul, Rupdarshir Naksha etc. 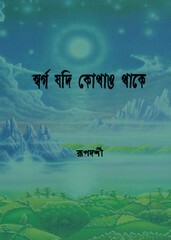 Now I’ll share with you an another book of his Swarga Jadi Kothao Thake.